As you pack away your summertime apparel (goodbye, linen pants and white shoes! 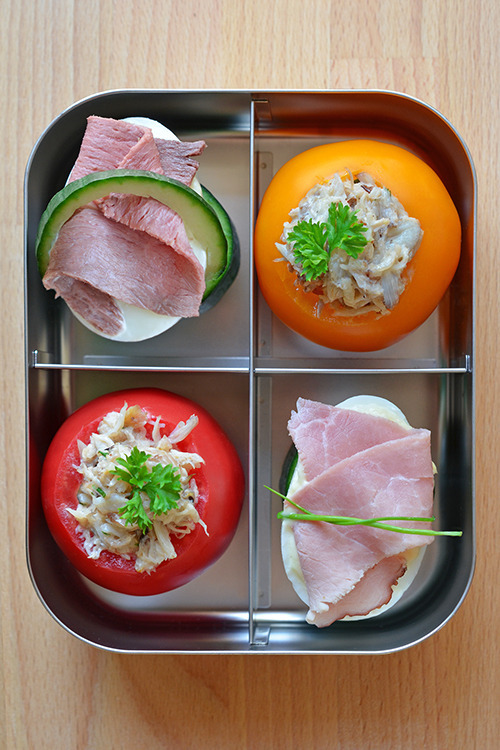 ), let me share with you my last installment of Paleo Lunchboxes 2014. 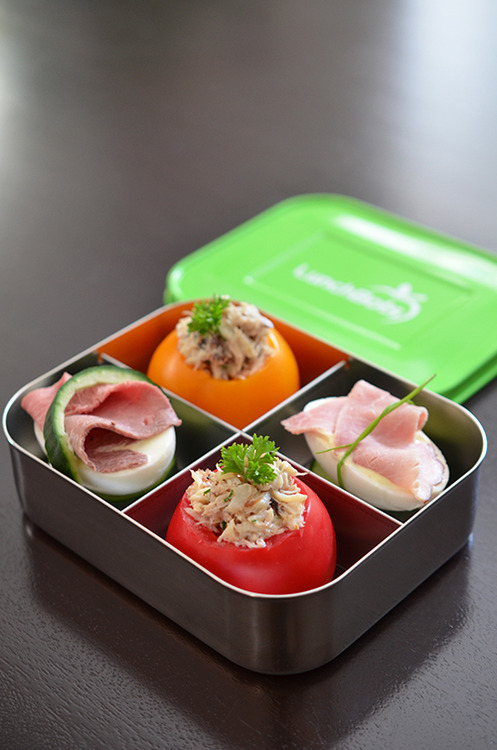 This lovely packed LunchBots bento is crammed with some of our family’s favorite finger foods: Lazy Devils (recipe in my cookbook and app) and Simple Crab Salad-stuffed tomatoes! For example, the Lazy Devils are also super-customizable. Feel free to top your halved Perfect Hard Boiled Eggs with whatever you have on hand. In Nom Nom Paleo: Food for Humans, I offer tons of ideas on how to spice up your hard cooked eggs. See? And if you happen to be allergic to shellfish, please don’t eat the crab salad stuffed tomatoes with a side of EpiPen. 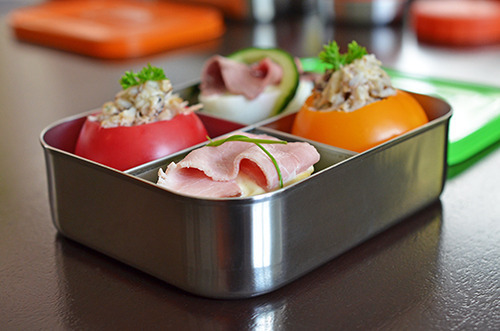 Instead, mix up a batch of Spicy Salmon Salad or Madras Chicken salad (the recipe for the latter’s available in my cookbook and iPad app), and spoon them into the edible tomato cups. Pro tip: use smaller tomatoes than I did. I used plus-size heirloom tomatoes to pretty ’em up for photos, but the only way the lid’s going to fit is by smashing the stuffing (literally!) out of them. Ready to check out how to assemble this portable feast? Hard boil a bunch of eggs. 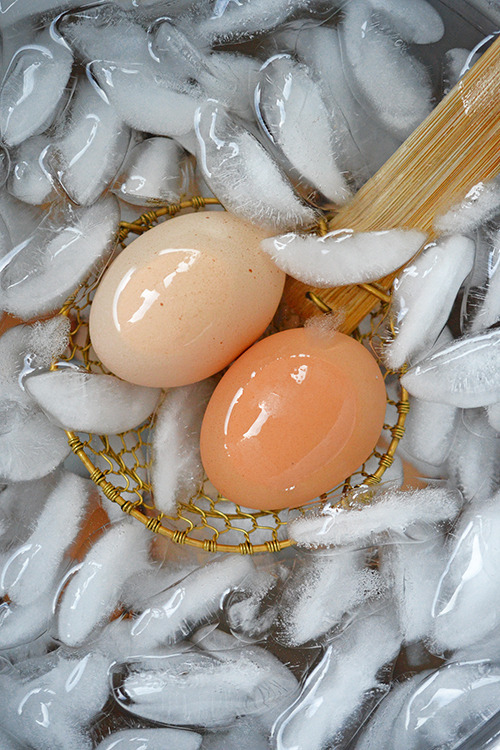 Even if you’re planning to pack just two or three eggs, cook at least a dozen. It’s always a great idea to stock your fridge with portable emergency protein for the week. 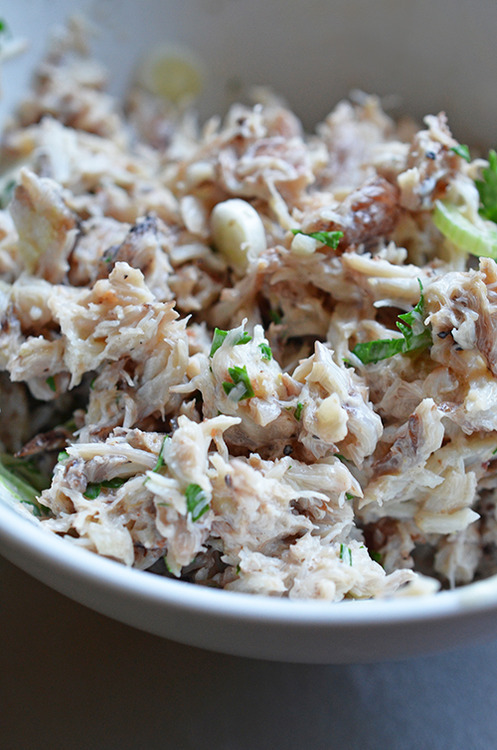 While the eggs are chilling in an ice bath, throw together a batch of Simple Crab Salad. Then, grab a couple of small tomatoes and cut out the stems. 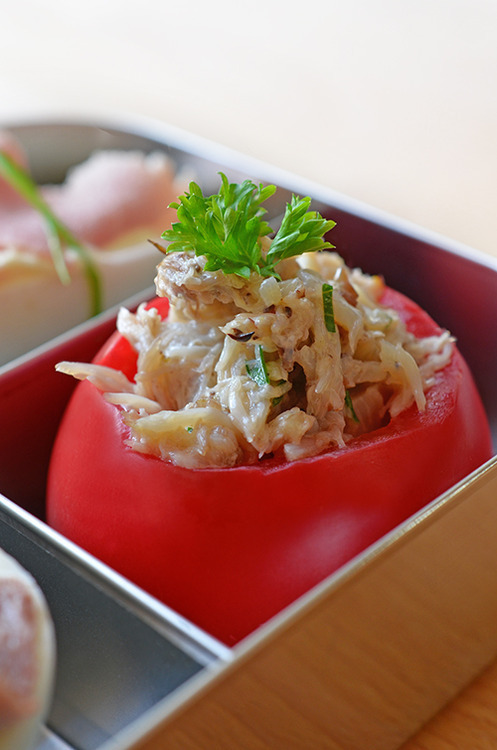 Use a melon baller or teaspoon to scoop out the seeds and fill the empty centers with crab salad. Hate ’maters? 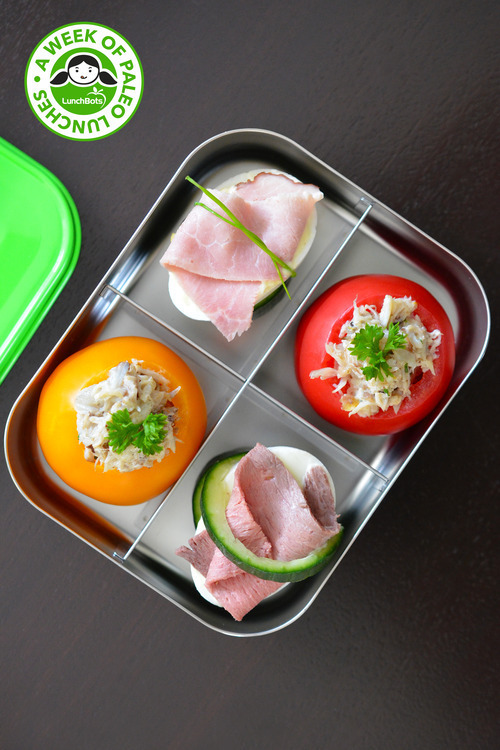 Use hollowed out mini (or halved) bell peppers or cucumber cups instead. Back to the Lazy Devils! 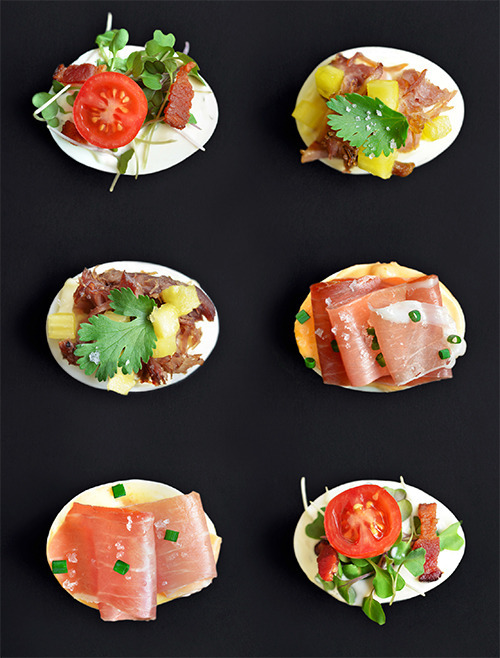 Simply peel and slice the cooked eggs in half, and smear on your favorite flavored Paleo mayonnaise. 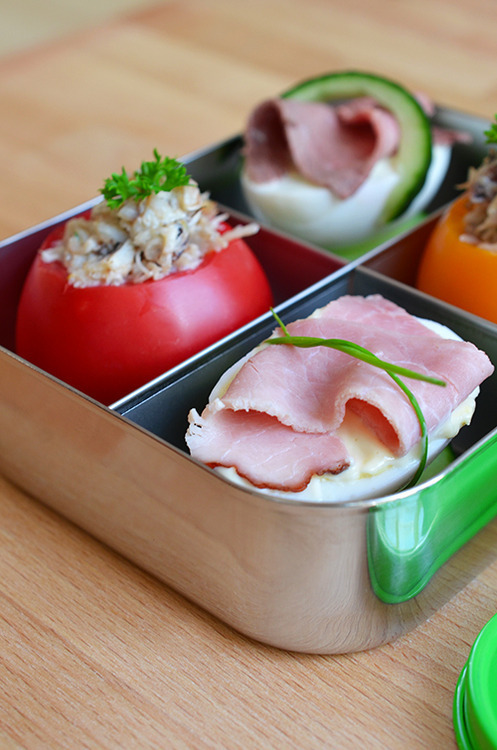 Top each halved egg with your favorite sliced meat (you know, like roast beef or ham) and secure it with a chive tie or a ring of sliced cucumber. Ta-dah! Pretty enough to eat!